Location: Bridge over River Rhondda linking former Lewis Merthyr Colliery on Coedcae Road with town centre on Trehafod Road. Bridge shown on this site in OS Second Edition Map 1900. Inscription records widening in 1907 and reconstruction in 1927 by Rhondda Borough Council, designed and erected by staff of Council with structural engineer E. Taylor and made by Horsehay Co., of Shropshire. Originally carried a tramway. A single span road bridge; of bow girder construction comprising 2 painted curved metal parapets with uprights and diagonal braces on either side of the road, with adjacent on each side a footpath with latticework parapet and pyramidal caps and billet mouldings to uprights. End piers of channelled concrete with moulded shallow pyramidal caps over billet moulding; cast inscription on each end pier surmounted by decorative shaft. Beneath, the metal supports end in scrolled corbels on upstream side. Rockfaced stone abutments. These show evidence of widening and the footings of the cutwaters to the previous bridge are visible. 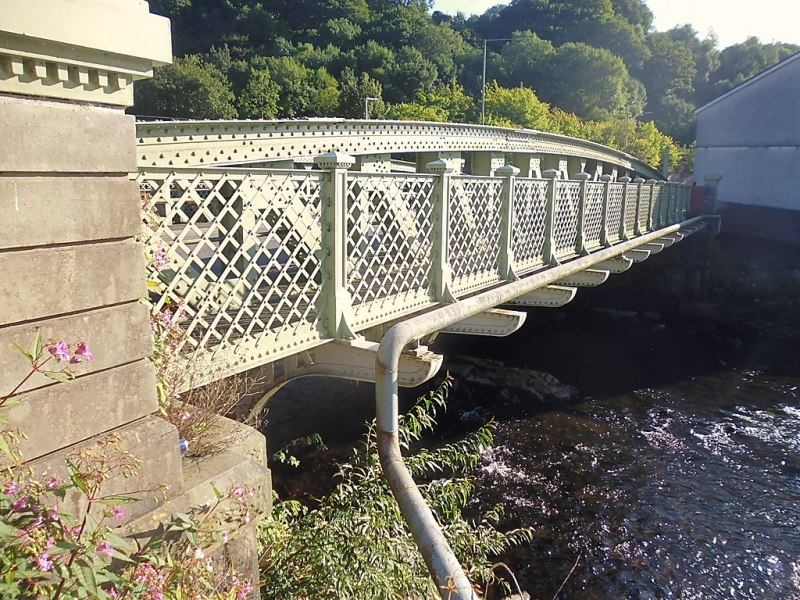 Listed for its special interest as an intact example of this type of inter-war bridge construction. Set back from the road behind iron railings. Located to E of Trefor winding engine house. Located to E side of the Trefor pithead. Located next to Coedcae Road at the centre of the complex. Located on the N side of the complex, the eastern of the 2 pitheads. Located between the 2 headframes at the N side of the main colliery yard. Located facing Coedcae Road at the W side of complex.